I very much enjoy searching for great places to stay when we have decided where we want to go for our next trip. There are just so many wonderful places to stay, to experience. So when looking for a place in Provence, in Vaucluse, when I saw the name of this place–Auberge du Vin–well, I was more than intrigued. The Auberge is operated by Linda and Chris, a couple who not only operate a wonderful Auberge, but also are certified wine instructors. All we were looking for was a nice place to stay. Well, we got that and a great mini course on wines in the Vaucluse region. The Auberge is nestled in the middle of three wines vineyards (grenache, syrah and viognier), in between Carpentras and Mazan, making it strategically located for visiting all parts of the Haute Provence and the Rhone region. Nice accommodations, wonderful pool and garden area, and very hospitable owners. We’ve taken numerous courses and tastings before, but this was the best yet. 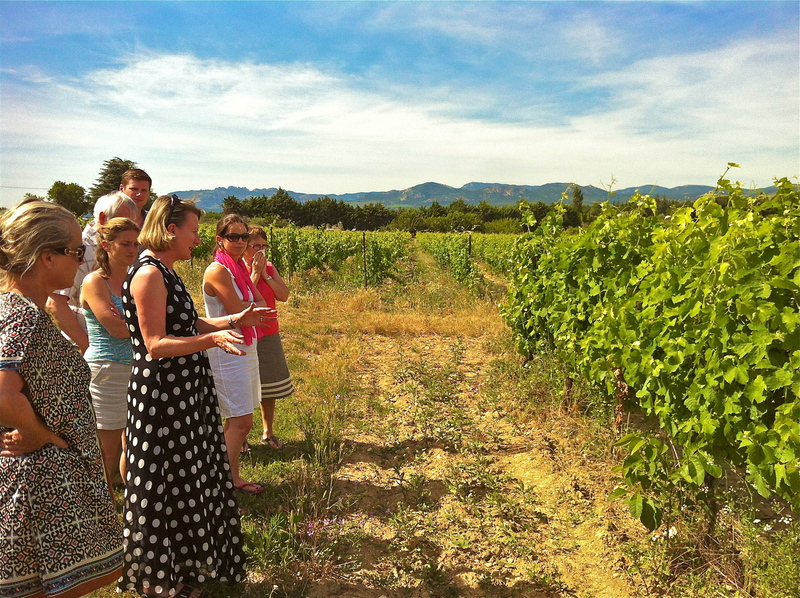 Linda knows her stuff, and she doesn’t have to go far to provide product for her course on Rhone wines. After talking a bit about the history of wine in the region, the types of grapes available, and the concept of the appellations, we then stepped right outside the Auberge and see firsthand syrah, vionier and grenache growing on the vines. Our course involved eight tastings of wines; two Viognier whites (the “new” Chardonnay), two cru reds from Beaumes de Venise, two desert wines (a red and a white) and a Chateau Neuf de Pape with a surprise bottle of 2001 Domaine la Tourade that was simply amazing. While in the Americas we tend to classify wines by the grape type (Cabernet Sauvignon, Pinot Noir, Merlot, etc. ), in France it is by region (Bourgogne, Cote de Rhone, Bordeaux, etc.). Which can explain why I’ve always had trouble finding a good selection of Pinot Noir wines in French wine stores; all Bourgogne red wines are Pinot Noir! While I knew that keeping wine in oak barrels helps the wine live longer, I discovered that is also provides the tannins in wine, and that when a wine is is strong in tannins it tends to dry out the mouth, while a wine with a good acidic balance will make the mouth watery. The Rhone region produces more than 370 million bottles of wine a year, more than a million a day. While most wines today are picked by machines, the higher quality Cru wines have to hand-picked, so limit damage to the grapes. If you are looking for a wonderful place to vacation (Provence) and also learn a little more than about French history, The Auberge du Vin may be the place you may want to consider for your next stay. 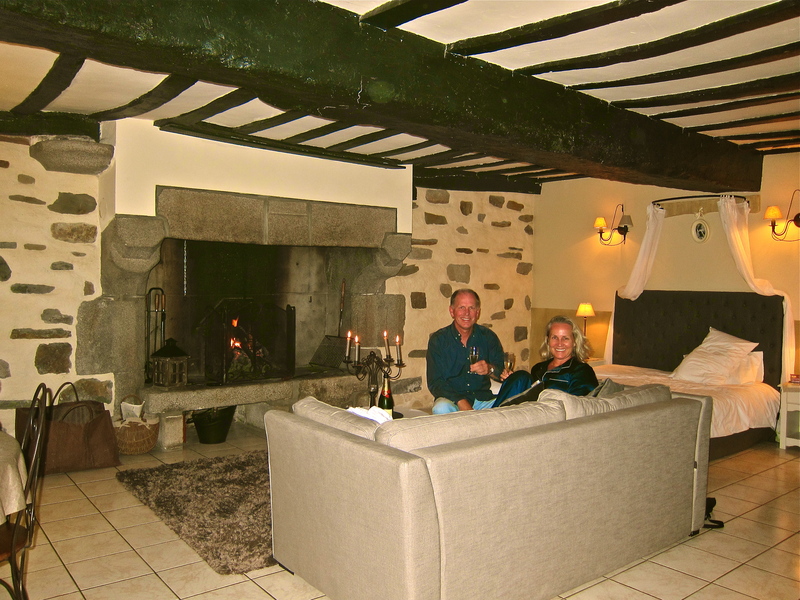 Our special in-room dinner service began with a wonderful massage for both of us, which was just what we needed after a long day of exploring medieval chateaus and towns in Brittany. It was followed by a fire lit in the large fireplace in our room, served with a demi-bouteille of champagne and appetizers. As the last sips of the champagne went down, the Manoir staff re-appeared to set up our table with salad plates, a bottle of Bordeaux and a wooden cutting board with a large raw coté de Boef steak and aluminum wrapped baked potatoes. They then set up a special grill in the fireplace and left us with instructions that when we were ready, to grill the steak five minutes each side and reheat the already baked potatoes. 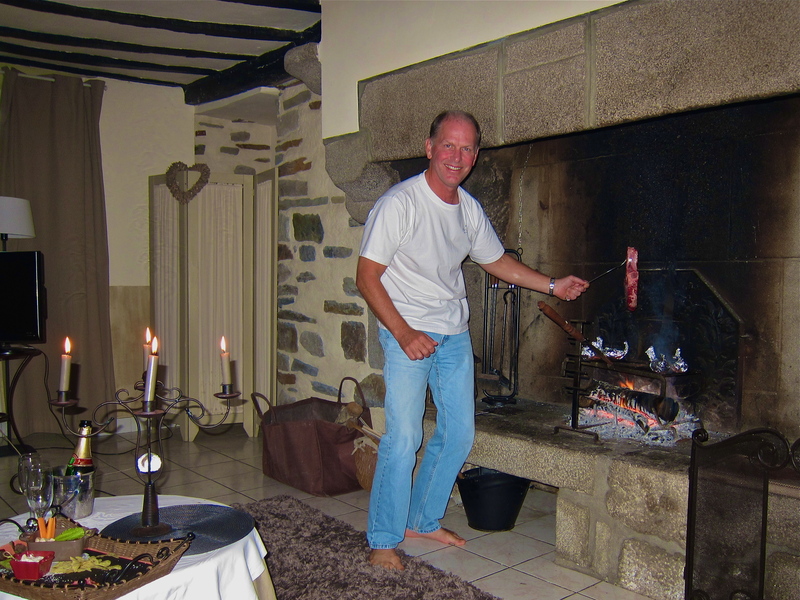 We followed the instructions shortly after and the end result was a fantastic dinner for two by the fire in our room. Quite something. Oh yes, almost forgot. Dessert were to small pots, individual-sized with an apple crisp topped with chocolate chunks. A few minutes on the grill and we had hot dessert to finish off an unforgettable dining experience at the Manoir de la Begaudiere.